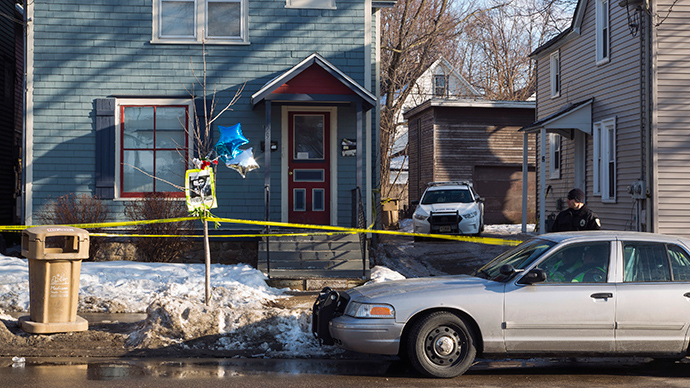 The Wisconsin police officer who fatally shot unarmed 19-year-old Tony Robinson in March has been exonerated by the Madison Police Department, making him eligible to return to work. Officer Matt Kenny, 45, was cleared of wrongdoing following an internal investigation conducted by the department. Kenny, who is white, has been on paid leave since shooting Robinson, who was biracial, but police determined that the officer had not breached the department’s deadly force rules during the incident. At a Wednesday press conference, Madison Police Chief Mike Koval said the department concluded Kenny followed police protocol during the incident and dismissed the suggestion, voiced by critics, that Kenny be removed from the force. Kenny can return to active duty, but he will first be assigned to the training division, reported local journalist Allison Geyer. He will also receive trauma counseling. Jim Palmer, Kenny’s attorney and the executive director of the Wisconsin Professional Police Association, said his client “looks forward to being able to continue his service to the people” of Madison. However, Andrea Irwin, Robinson’s mother, was angry with the outcome. The shooting took place on March 6 when Kenny responded to reports that a man had been “battered” by Robinson, police said. Several witnesses are said to have told police that Robinson was also “tweaking out” at a traffic scene, jumping onto the street and creating a safety hazard. Toxicology reports showed that Robinson had several drugs in his system at the time, including Xanax, marijuana and psilocybin (mushrooms). Kenny arrived at the scene and followed Robinson into an apartment, apparently belonging to Robinson’s friend, because he said he heard what might have been a disturbance inside. Once inside, a confrontation occurred and Robinson was shot. Kenny claims Robinson punched him and feared he would wrest away his gun. Although Kenny tried to administer first aid, Robinson later died at a nearby hospital.